Before heading to the grocery store, I like to scour my pantry and refrigerator for anything I can use to throw together one last meal. 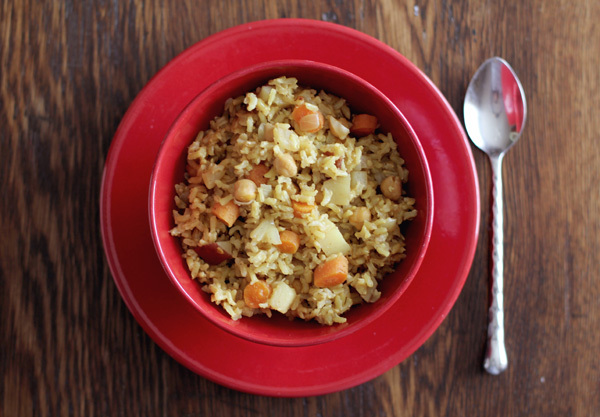 Curried chickpeas and rice is a favorite pantry-purging meal of mine. 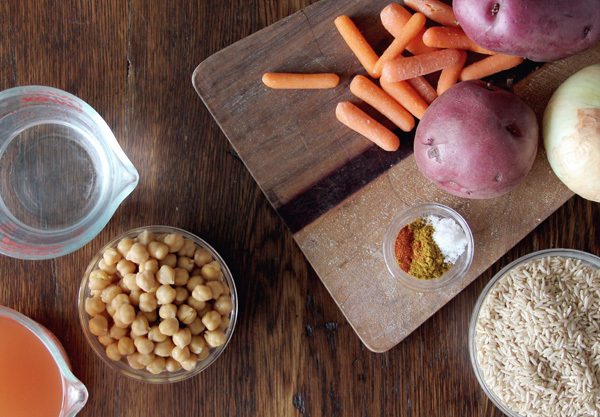 You can use any root vegetable of your choice, and season it how you like- it’s an easy, versatile, one-pot meal. *I also like to use white wine for some of the liquids and add garlic when I have it on hand. Heat up some olive oil in a deep pan (that has a lid), and saute the diced potatoes and chopped onions (and garlic at the end, if you’re using it). After the onions carmelize a bit, dump in the rest of your ingredients, stir to combine, and put a lid on it. Let the pot simmer on low for about 45 minutes, or until the rice has absorbed all of the liquid. This looks yummy. We do the same before going to the store. Sometimes those meals are the best ones. I love all things curry! Looks absolutely delicious!